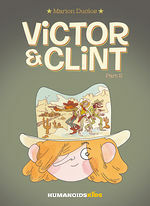 Hounded by neighborhood bullies, young Victor becomes Clint and escapes into an imaginary world, where the Wild West is real, the hero always wins and bullies learn their lessons! Victor is a small-town boy, spending his days playing with his dog and losing himself in his imagination. When two local boys begin bullying Victor, he escapes into a dream world, where the Wild West is real and he's the hero! An ode to imaginary childhood escapades in the form of a laugh-out-loud spaghetti western.